AAGL’s mission is to advance minimally invasive gynecologic surgery both locally and worldwide. With this in mind, AAGL generously made available the Master Course on vaginal hysterectomy to a newly created training program. 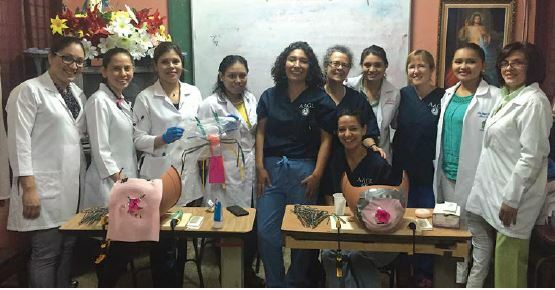 Gynecologist from Stanford University School of Medicine, and Kaiser Permanente-Richmond and Oakland, established “Global Outreach for Gynecologic Surgery,” (GO GYNS), a training program for gynecologic surgeons in low resource environments. The program debuted this fall in Nicaragua, chosen because it is designated by the United Nations as a developing economy and it also is reported to be the second poorest country in the Western hemisphere, with severely limited medical capacity. The setting for the training was a Nicaraguan government teaching hospital. We specically chose a teaching hospital, as it aligned with the goal to increase the capacity of gynecologic care given by Nicaraguan physicians by training both residents and practicing gynecologists. The hospital has two active Ob/Gyn operating rooms with basic surgical equipment, including both general and spinal anesthesia capabilities. There is limited blood available in the hospital: 4 units of PRBC. The country’s only blood bank is located 2 hours away in the capital city of Managua. The GO GYNS curriculum was designed based on the hospital faculty’s perceived need. The faculty identied their discomfort with the vaginal approach to hysterectomy resulting in a low rate of vaginal hysterectomy (only 7%), with the other 93% being an abdominal approach. Unfortunately, laparoscopy is not available in government run hospitals. The GO GYNS program consisted of the video series provided by AAGL SurgeryU “Master Course on Vaginal Hysterectomy, and was further supplemented with lectures and hands-on simulations by the GO GYNS team. This video series proved extremely helpful in outlining the techniques of vaginal hysterectomy in a stepwise manner. The physicians and residents were found tohave strong surgical skills, excellent fundamental knowledge and were fast adapters to the new techniques presented. Plans are now being made to return to Nicaragua and provide consulting in the evaluation of appropriate surgical candidates, followed by mentoring during actual surgery. By the conclusion of the program it was clear that imparting vaginal hysterectomy techniques with the aid of the AAGL Master Course on Vaginal Hysterectomy video series, will enable physicians to condently provide better and safer care for women in developing countries. Kay Daniels M.D., is Clinical Professor, Obstetrics and Gynecology and Co-Director of OBSim at Stanford University School of Medicine, Palo Alto, California.